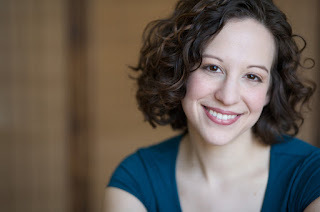 American soprano Jennifer Zetlan made her Seattle Opera debut in 2010 as The Flier in Amelia, a dream-version of a well-known missing-in-action 1930s aviatrix. This summer she flies again at Seattle Opera—both as a Bird and as one of three singers who appear, suspended above the stage in this production’s now-famous Rhine Daughter harnesses. I spoke to this remarkable soprano, whose crystal-clear diction even in the highest tessitura is a god-send for composers writing in English, about the trajectory of her career in Seattle so far, about her two fascinating roles in the Ring, and about what she’s learned about her characters from her young daughter. 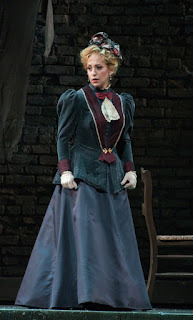 Jennifer, you’re doing so much traditional rep for Seattle this year – Puccini (Musetta in La bohème), Wagner, Verdi (Gilda in Rigoletto next January). Is that usual for you? No, not at all. Mostly I do new music, or off-the-beaten path things. It's nice to get to do lots of standard stuff in Seattle! Well, you started here with new music, with Amelia. How did your affinity for singing new music come about? Was it your choice? I wouldn’t say it was exactly my choice...I really like new music, I gravitate towards it. And I think I’m lucky that it has gravitated toward me, as well. I’ve been offered plenty of interesting and varied work. Is it also that you have a proven track record—that you can deal with new scores written full of esoteric harmonies, or with strange time signatures, that you actually sing them right? Sure. But then it’s nice to come to Wagner, where no one is going to throw new pages at me. It’s like vacation! What languages do you sing? English, Italian, French (once even dialogue in French), German, Russian, Portuguese, and one time I did a whole opera on "ah!" 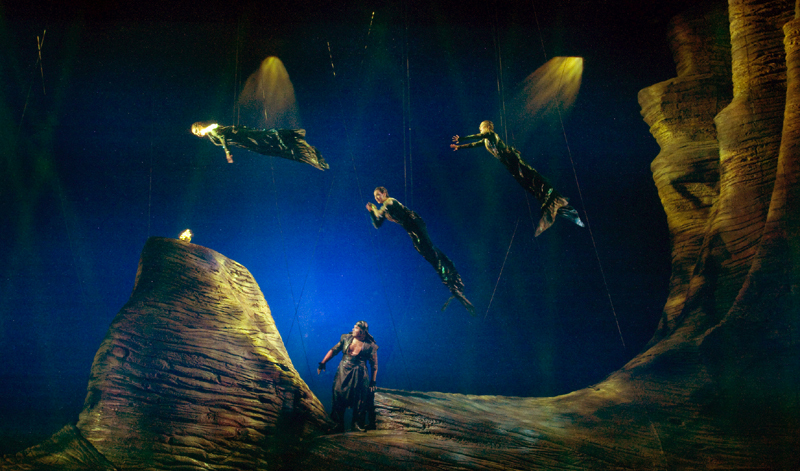 Speaking of singing in unusual languages—your character of Woglinde the Rhine Daughter gets the first line in the Ring, “Weia, waga, woge, du Welle, walle zur Wiege, wagalaweia, wallala weiala weia!” What language is that? We’ll return to Woglinde and her crazy opening line in a second. Tell us what Rhine Daughter flying has been like! It’s great! It’s difficult to rehearse, because we aren’t in the exact place doing everything all at once—we’ve had to rehearse it in pieces, to deconstruct it. Because you can’t rehearse in the exact spatial relationships to each other which you will be onstage. 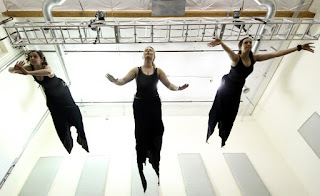 Yes, and there are so many types of movements happening: both our horizontal and vertical traveling, plus our pivoting, all of which are controlled offstage by members of the crew, and then our flipping and turning somersaults, which we control, not to mention the swimming motions we make with our arms and legs. Right, and that swimming has to be done knowing exactly how you’re ABOUT to move. Yes, it has to look like we’re starting each movement. Even though we control almost none of it, we have to look like we’re in control of the staging! How weird. Have you ever done anything like this before, in your career? 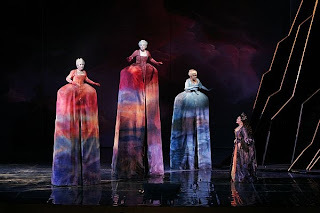 Yes, in the Met’s Ariadne, the three nymphs are moved about in these enormous, beautiful cages. And again, we had to learn where we were going, so that it looked like we initiated each movement. The character has to appear to have one complete thought, even though multiple people are responsible for the movement. It must be like animation—how many people worked on getting that cartoon mouse’s arm to move just right. And...do you like being up there? Wearing a harness and flying twenty feet above the floor is...well, I wouldn’t call it comfortable...can’t say I don’t have any bruises! But you get used to it, like anything. We began rehearsing early, so we had plenty of time to figure it out. It’s certainly worth it—it looks really, really cool. So, let’s talk about your character, Woglinde the Rhine Daughter, and perhaps we should start with that weird opening line, whatever language that’s in. It’s sort of German. It’s German-ish. It’s like a playful lullaby, like something she’s sung for a million years. It doesn’t mean anything. It means whatever I want it to mean! It’s just so joyful. It’s about unmitigated joy, the freedom of swimming, and this wonderful life. She’s so happy, it just explodes out of her in this “Wallala leia” gibberish. Wonderful nonsense. Speaking of not having much sense...why do you spill the beans to your friend Alberich there? 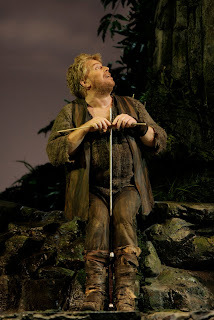 You’re the one, Woglinde tells him all about how to steal the Rhinegold from the river by forsaking love. Yes, I start it, I tip the can. I think it’s just this wonderful...innocence. I have to think that way, otherwise I would HATE Woglinde, all the hours of suffering and agony we have to endure because of her! [laughs] She doesn’t think it’s possible that anything could be different than it is now. Can’t imagine that life could be different. So she’s just sort of talking, like her nonsense of “Weia, waga, woge du Welle,” these words just spill out of her. Right, it’s so sad, to think that somebody could do that. So can she imagine it? Or is that something she’s been told? You know, it’s like when a child loses their pet goldfish, and processes death and loss for the first time: “What do you mean, it’s dead? I don’t get it.” Trying to figure that out, how that changes the whole world. Has that happened to Woglinde yet? It seems to me that “Father,” Father Rhine, whoever he may be, he must have said it to them like this. That he felt a sadness when he explained this to his daughters, and that made an impression on her. Aha, so she’s singing the tune he sang when he first told her about it. Yes, and she understands that there’s a sadness to the idea that someone might ever do this. But has no ability to connect that idea with...how mean she’s being to lovesick little Alberich, here. Right, these girls are a little clueless! What’s it like to sing all the close harmony you have with your sisters? Oh, it’s so great! We’ve known each other for a long time, we were all in school together. Cecelia [Hall, who sings Wellgunde] and I first did a summer program together in 2004. Is it hard to get the voices to blend properly? I was going to say, “Jazzy,” but “Thorny” is good too! Yes, that’s actually closer to the music I normally sing! I have a weird fondness for singing twelve-tone roles...I know, it’s a quirk! I don’t have time to get in my own head when I have to think about intervallic singing. Götterdämmerung certainly isn’t tone rows...but the harmony is suddenly very different, and I think it captures the anger and frustration they have, with Siegfried in that scene. It shows how they’ve grown, from Rheingold to Götterdämmerung. Oh, that’s interesting...in Rheingold, when you sing that beautiful “Rheingold! 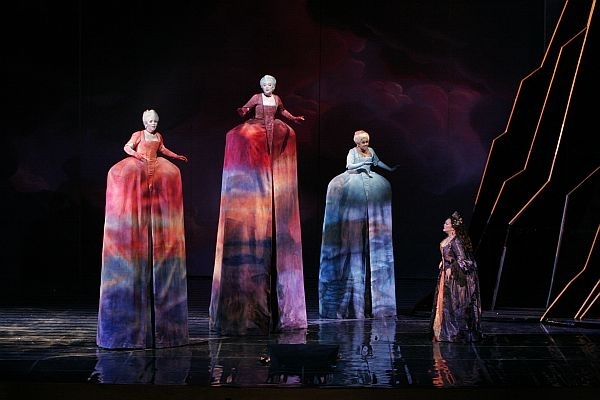 Rheingold!” trio, the harmony is pre-Tristan, let’s say. There’s Wagner in there... Rheingold isn’t all Mozart or Haydn. But for that moment in Götterdämmerung, when they’re all agitated, he turns on this amazing thing in the harmony. It’s an outpouring of frustration. Yes, they’ve been frustrated for a very long time now. Their world is not the beautiful place it once was. It’s been dark, for so many years. And with that, all these new harmonies are available to them. Now, we were talking a moment ago about the blend of voices—are the Rhine Daughters separate characters, with individual voices, or is this one character with three heads? Good question. When we sing together, I wouldn’t say we are trying to blend. You sing with your distinct, individual solo voices, and you get a special sound, instead of changing how you sing when you sing together. Wagner highlighted the differences, so we don’t really have to do anything special to make the three characters distinct. Now, in addition to being a Rhine Daughter, you’re also a bird. Right. It’s all about flight, this summer! Huh! You’re right—but I hadn’t thought about that. Oh, yes! And what rivers of ink have been spilt trying to explain that...although I like the theory that Wagner just couldn’t come up with a new melody, so he re-used your old one! [laughs] No, the intervals, for Woglinde’s motif and the Bird’s motif are the same—the Bird starts a little higher—but the rhythms are different. The Rhine Daughters sing in this bouncy 9/8, but the Bird...the rhythm for the Bird’s version is really perplexing. Wagner notates the rhythm in different ways. As I do it, you sing 9 notes where you would ordinarily fit 6. The orchestra is in 9/8 there, whereas the voice is in 4/4, and we have to meet on the third beat of each measure. But when Siegfried quotes the Bird’s line, when he’s telling the story in Götterdämmerung, he uses a slight variation of the rhythm. Basically, I think Wagner was going for the freedom of an actual bird. It shouldn’t be metered—it should sound improvisatory, like a bird call. That’s how I understand that melody, [hums tune of “Hei! Siegfried gehört nun der Nibelung Hort.”] But for the other one—[hums clarinet tune from “Forest Murmurs”]—that’s an actual bird call, a wood thrush. Yes, Messiaen notated that, and there’s a song by John Duke, “The Bird,” full of that. A real sound made by a real, Planet Earth bird...I love the idea of all these composers out birding, jotting down in musical notation sounds they hear in nature. That’s amazing. And as you sing it, you’ve got lots of syllables. Harder than the Rhine Daughter’s alliterative tongue-twisters? The alliteration helps! I can think “this is the W-line, the T-line, the F-line!” The Forest Bird is divulging information in an improvisatory but efficient manner, and it’s quite tricky. Right, she has so much plot information. You only have four supratitles, or so, but each of them is crucial. Say, why are you giving Siegfried all this information? What’s in it for you? I think it’s just something that nature knows, and Siegfried is connected to nature in this special way. He’s innocent and fearless—I think perhaps the birds have been saying this to him all along, but he didn’t understand it until he tasted the dragon’s blood. Yes, the clarinet keeps chirping throughout that scene, even before he can understand...that’s the Bird TRYING to speak to him. Are you guys Disney birds, you know, like all the non-speaking sidekick birds who hang out with Snow White? I think Siegfried is this child of nature, and they’ve always been talking to him. He just hasn’t been clued in in the right way. Yes, it’s sort of a flash of genius, on his part. In that scene where he’s trying to learn bird-language he says, basically, “If I make the same sound as the bird, maybe I’ll be able to figure out what it means.” Which is exactly how a little kid learns language—you start by imitating, mimicking what you hear. It’s true, my daughter is learning to speak right now, and we’re constantly doing that. It’s just that with the dragon’s blood, Siegfried gets the fast track. Well, he tries, first, with his silly reed, but that doesn’t work very well. So you give him all this information...you must perceive that he’s somehow on the side of nature. I notice you don’t give Mime any help! Right, why does she tell him about the sleeping woman on the rock? Handy bird to have around! Although I suppose birds have always been associated with fate, reading omens in birds, that kind of thing. Now, do you do anything, vocally, to sound more birdlike? No. He wrote it really well, and it’s well-suited to my voice. I think of it like a trumpet: like I’m heralding this news. How come your characters—both the Rhine Daughter and the Bird—are so well-informed? How is it that you know so much? 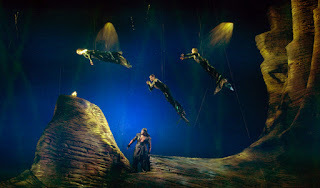 I don’t know, it’s in the waters, in the river...we have this curious psychic connection with the Norns, who know everything. Maybe they come for a dip in the river every once in a while! I hope Seattle has better opera than San Francisco. SF Opera's "The Gospel of Mary Magdalene" was pretty bad. Slow story, bad music, and weak singing sunk the whole show. It needs campy elements and hot chicks a la "Salome."